What Would Jesus Drink? 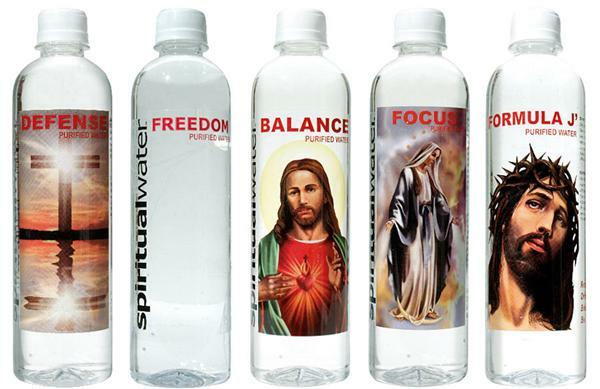 Spiritual Bottled Water, Of Course! Todd Jarvis sent me this link to an article by Lisa Miller in the 17 December 2007 issue of Newsweek. It's about yet another bottled-water marketing scam to bamboozle the public. But then again, we had stuff like this when I was a kid. It was called ''holy water". Miller points out how water has been critical to faith for thousands of years. Water is the medium of baptism in Christianity. Muslims wash before they pray. Now marketers are capitalizing on that fact and selling bottled water to bring out the spirtuality (??) in us all. But not everyone thinks this is a good idea. The article follows. When you get to the part about Liquid OM you'll swear you're back in Marin County in the 1970s. You need only go back to the first chapter of Genesis to see how elemental water is to the observance of faith: "And the Spirit of God," the Bible says, "moved upon the face of the waters." In the Torah, water is used to ordain priests and to purify the sons of Aaron before they enter the temple. In the New Testament, John baptizes Jesus with water from the Jordan River. Observant Muslims wash hands and feet before they pray, orthodox Jewish women take ritual baths once a month—and every Christian denomination still uses water as part of its sacred rites. Mormons, when they take the weekly sacrament, drink water instead of wine. Courtesy of Spirtual Water and Newsweek. The most recent entry in this niche is Spiritual Water. It's purified municipal water, sold with 10 different Christian labels. The Virgin Mary bottle, for example, has the Hail Mary prayer printed on the back in English and Spanish. Spiritual Water helps people to "stay focused, believe in yourself and believe in God," says Elicko Taieb, the Florida-based company's founder who was formerly in the pest-control business. All three companies give a portion of their profits to charity. So it's not surprising that a few savvy marketers would seize on this universal symbol of purity for financial gain. Inspired, perhaps, by vitamin and energy waters, a number of new companies have begun making more explicit claims: their water doesn't just promote good health, it actually makes you good. Holy Drinking Water, produced by a California-based company called Wayne Enterprises, is blessed in the warehouse by an Anglican or Roman Catholic priest (after a thorough background check). Like a crucifix or a rosary, a bottle of Holy Drinking Water is a daily reminder to be kind to others, says Brian Germann, Wayne's CEO. Another company makes Liquid OM, superpurified bottled water containing vibrations that promote a positive outlook. Invented by Kenny Mazursky, a sound therapist in Chicago, the water purportedly possesses an energy field that Mazursky makes by striking a giant gong and Tibetan bowls in its vicinity. He says the good energy can be felt not just after you drink the water but before, when you're holding the bottle. This small band of feel-good entrepreneurs may face objections from a surprising quarter. Some religious believers, also convinced of the elemental importance of water, are campaigning against its ubiquitous sale and packaging on the grounds that the practice is neither ethical nor good for the environment. "Water is life," says Sister Mary Zirbes, a nun in the Franciscan Sisters of Little Falls, Minn. "It really should not be a commodity to be bought." The Franciscan Sisters, together with a community of Benedictine nuns nearby, have launched a letter-writing campaign against the largest producers of bottled water and they've designed coasters to encourage people to drink glasses, not bottles, of water from the tap. The Vineyard church in Boise, Idaho, sells slim reusable plastic bottles in its bookstore, and it has placed water stations throughout the church. "In a world where a billion people have no reliable source of drinking water, where 3,000 children die every day of waterborne diseases, let's be clear: bottled water is not a sin, but it sure is a choice," says Richard Cizik of the National Association of Evangelicals (NAE). "Spending $15 billion a year on bottled water is a testimony to our conspicuous consumption, our culture of indulgence." Taieb calmly refutes the implication that his Spiritual Water is bad for the planet. People put fewer of his bottles in the trash, he says, because they don't want to discard images of Jesus or Mary. Instead, they refill them with other beverages. Obviously, even do-gooders can disagree. Some believe that water is life, while others believe that water is their livelihood. John Fleck sent me a link to Dennis Kucinich's WWW site that deals with sustainability. His statement about water is near the bottom. He's got 10 principles he refers to as 'Water Marks'. All water shall be considered to be forever in the public domain. It shall be the duty of each nation to provide accessible, affordable drinking water to its peoples. There shall be public ownership of drinking water systems, subject to municipal control Wealthy nations shall provide poor nations with the means to obtain water for survival. Water shall be protected from commodification and exempted from all trade agreements. Water privatization shall not be a condition of debt restructuring, loan renewal or loan forgiveness. Governments shall use their powers to prevent private aggregation of water rights. Water shall be conserved through sustainable agriculture and encouraging plant-based diets. Water resources shall be protected from pollution. Our children should be educated about the essential nature of water for maintaining life. [I would] recommend a series of declarative sentences which can serve as the basis for a course of action. We shall call these ten principles 'Water Marks'. Jared Simpson's Waterblogged.info blog just named its Ten Top water blogs and I am happy to say that WaterWired is on the list. Check on the link to see the other top water blogs. Thanks, Jared. The check is in the mail. Seriously - much appreciated, Jared; I'm humbled and honored. HAPPY BIRTHDAY, ANN ! WE MISS YOU! Okay, so it's not "fresh water", but it's great displacement behavior so I decided to post it. Here is an interactive map that enables you to see the effects of sea-level rise -- up to 14 meters in one-meter increments -- any place in the world. I got this from a post by Michael Furniss on the Watershed Management Council's (WMC) WWW site. Find out whether you should start buying distressed Florida real estate, or leave it for someone from Brooklyn. Perhaps Las Vegas will become a port soon, without having to implement the Colorado River Access Project (CRAP). The "Yuck (as in Yucca Mountain) Factor"
No, this is not another post about what engineers and psychologists call the "Yuck Factor" - reclaiming waste water, converting it to drinking water, and getting people to accept it. 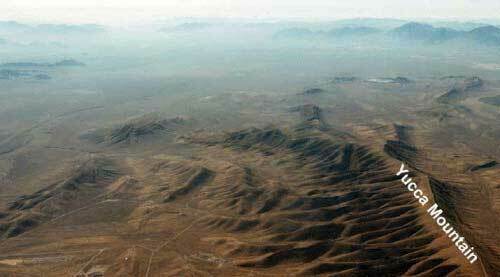 But it is about the proposed Yucca Mountain Repository and the U.S. Department of Energy (DoE) - Office of Civilian Radioactive Waste Management's (OCRWM) inept attempt to find a place to store the 7o,000 or so metric tons of high-level commerical nuclear waste (HLW) from the nation's nuclear power plants. The stuff is now being stored underwater on each plant's site, hardly a safe place for it. And yes, it's "Yucc-y" all right. 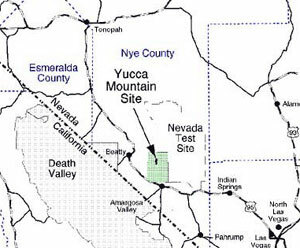 Yucca Mountain is located about 100 miles northwest of Las Vegas, on the western boundary of the Nevada Test Site (NTS), in Nye County. The NTS is the DoE facility that has been used for atmospheric and underground nuclear weapons testing since the early 1950s. To illustrate what a mess DOE has made of the USA's search for a HLW repository, let me relate a story. When I got out of graduate school in 1976 I interviewed with the forerunner to the U.S. Department of Energy (I believe it was still called the Atomic Energy Commission) to work on the characterization of nuclear waste repositories, mainly Yucca Mountain. At one point in our conversation the interviewer laughed and said how I would be out of a job in 1988, when the site characterization would end so construction could start for the 1998 opening. Uh-huh. The best estimate I've heard is that the Yucca Mountain Repository (YMR) will open in March 2017. If I were a betting man I would not put money on that date. I am not going to go into a great deal of detail here. I used to be involved in Yucca Mountain and the Nevada Test Site, but that was almost 20 years ago. Disclosure notice: while I was at the Desert Research Institute (DRI) I worked for both the DoE-NTS and the State of Nevada's YMR Program. I have maintained more than a passing interest in YMR issues, however, and a recent story in the Las Vegas Review-Journal (RJ) once again piqued my curiosity. The story reported how DoE had spent $13m to replace data tainted by the infamous USGS e-mail exchanges, in which USGS hydrologists intimated they were falsifying QA (quality assurance) records as they developed an infiltration model. Infiltration of water at the surface of Yucca Mountain and downward migration to the repository horizon 1000 feet below are critical issues, as the water could facilitate migration of radwaste out of the repository and into the underlying regional ground water system. The RJ article said the Nuclear Waste Technical Review Board, an independent group that reports directly to Congress, said the new infiltration model developed by DoE and Sandia National Laboratories (SNL) “did not consider all available data, was not calibrated with other site information and did not consider likely significant evaporation." Rep. Jon Porter (R-NV) said “it is obvious” DOE tried to “shortcut” research in order to stay on schedule. Looks like it is back to the drawing board. It drastically understimated the resistance of Nevada. It figured that since Nevada had little political clout and had tolerated nuclear weapons testing since the early 1950s, what's a little radwaste when you've let the government explode nukes just northwest of your largest city? Initially, the LV business community cautiously welcomed the YMR (jobs and growth) but no longer. They have all the growth they can handle. The state's resistance has grown with time and stiffened greatly since 1987, when Congress decided to stop repository studies in Texas and Washington and focus on Yucca Mountain, an event known locally as the "Screw Nevada Act". DoE outsmarted itself by choosing Yucca Mountain. It figured a topographically high site would be good - higher above the regional ground water system. Normally that'd be a very good assumption, but DoE did not count on having to deal with unsaturated fracture flow and mass transport, probably the most intractable problem in ground water hydrology. Unsaturated flow - tough enough; fracture flow - ditto. The two together - fahgeddaboutit! What DoE should have done is follow USGS scientist Isaac J. "Ike" Winograd's 1974 advice (article in Eos) and use an alluvial-fill basin as the repository site. Few people knew more about the hydrogeology of the region than Ike did. The seismicity and volcanism hazards were underestimated. But one thing is for sure: because of DoE-OCRWM, we have learned an immense amount about the hydrogeology of low-permeability environments and unstaurated fracture flow. One of my colleagues has said that DoE has been "hydrogeology's NSF" (National Science Foundation). Not that it wanted to be, of course. One reason we are having such difficulty in locating a HLW site is the great diversity of potential locations we have in the USA: deep sedimentary basins, bedded salt, low-permeability rocks, shield areas, arid regions, etc. In a place like Sweden, where you have nothing but the Fenno-Scandia shield and its intrusive igneous and metamorphic rocks, you make do with what you have and engineer the site accordingly. If you are interested in learning more, the RJ's YMR archives are here. Wikipedia also has some information, as does the OCRWM WWW site. Nevada has had a love-hate relationship with things nuclear. The license plate shown never made it beyond the design stage. The Clark County (Las Vegas area) seal of the 1950s was designed around a mushroom cloud. I remember friends in the Reno area telling me how they viewed announced atmospheric nuclear tests in the 1950s and made an "event" out of it. Yes, they could see the flash of light from a few hundred miles away. Ironically, Nye County, where the Nevada Test Site and YMR are located, vaguely resembles a mushroom cloud. Maybe someone at the old Atomic Energy Commission had a sense of humor. One thing you can't blame DoE for is the post-9/11 concern over terrorists hijacking waste shipments to the YMR, although people have been concerned over the possibility of traffic accidents and hijackings since the search for a national HLW site began. Another reason for the extreme resistance to the HLW repository program among some is the fear that if a " successful" repository site is found and opened, it will provide an impetus for more nuclear power plants. I learned that all too well when I gave a talk on HLW waste disposal options before the La Jolla chapter of Physicians for Social Responsibility (PSR) in 1989. After my talk, I was socializing and speaking with a few of the attendees (my wife-to-be, in attendance, referred to them as "Gucci liberals"). I made the point that we needed to find a place to store the HLW safely, instead of keeping the stuff on-site at each power plant. Referring to on-site storage, I said, "Is that what you want?" "Yes!" they replied in unison. The upshot: the wait for a HLW repository will just be a bit longer. Anyone care to bet on when? With Senate Majority Leader Harry Reid (D-NV) opposed to it, I think I will pass.